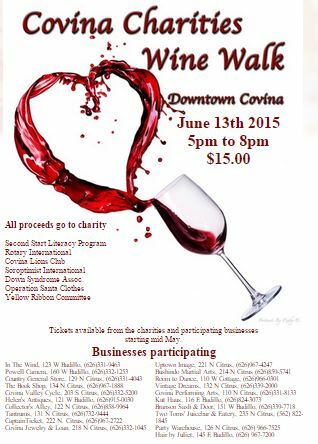 2015 Covina CA Wine Walk is this Month! Its that time of the year again! Time for our annual All Charities Wine Walk! Stroll around Downtown Covina and enjoy a variety of wines at each of the participating Covina businesses. While you are out and about make sure you take pics and tag #Covinawinewalk and #covinaresidents on Facebook or Instagram. Looking forward to seeing a great turnout!